getsix® GERMAN DESK – We advise you in the German language, as if you are in Germany. Every year thousands of German businesses and individuals invest in or expand with their businesses into Poland. As a market, Poland has much to offer and there is a long-standing history of active commercial activity between Germany and Poland. There are, however, considerable differences between Germany and Poland in terms of legal structure, on the one hand there are very different tax laws, and on the other there are Polish customary practices. For a ‘German Desk’ business this can mean complications when entering into the Polish market, and it is advisable to seek advice at an early stage. For many years the native German-speaking partners of getsix® and their team of experts, consisting of German-speaking Polish accountants and consultants, has been providing support and advice regarding Poland and international cross-border transactions to both commercial and private clients from Germany. Our expertise together with our ‘competence network’ partners, includes all areas which are relevant to businesses dealing in Poland; from starting up a company, advice on commercial contracts, joint ventures and acquisitions (M&A), to cross-border mergers or a listing on the stock exchange. getsix® also advise on related areas such as intellectual property, employment law, real estate and tax. Together with our close contacts in other professions, such as estate agents and financial advisers, we can provide a comprehensive service in relation to most commercial and legal aspects. getsix® experience in advising ‘German Desk’ and other international companies in Poland means we understand your specific requirements and can target them directly. In doing so we aim to ensure the best possible outcome for each individual client, on budget and on time. In fact our clients value our personal and clear advice, as well as the close relationship with our partners. This has meant that getsix® have been able to maintain many companies in German-speaking countries as our loyal clients for many years. At getsix®, we have a multi-disciplinary team specialised in the relevant areas for German-Polish cross-border situations, which is part of a privileged network with HLB Germany and HLB Poland that can address business issues in a co-ordinated manner. If you are considering investing into or doing business in Poland, getsix® would be pleased to discuss your plans and help you achieve your objectives. Polish exports to Germany in 2012 amounted to 35.6bln EUR, whereas imports reached the value of 32bln EUR, the Central Statistical Office announced on April 9th. 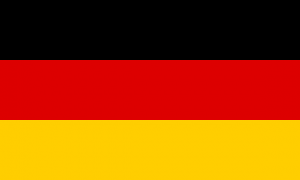 In 2011, exports to Germany reached 35.4bln EUR and imports – 33.5bln EUR. Furthermore, Poland has consistently recorded a surplus in trade balance with Germany since 2009. “In 2011, Poland and Germany achieved the highest trade turnover in their history. 2012 brought the economic slowdown and despite that we have virtually recreated the same result and that’s definitely a success.” said the Head of Economic Section of Polish Embassy in Berlin, Tomasz Kalinowski. Polish diplomats in Berlin stressed that according to ‘German Desk’ government calculations, the total trade turnover in 2012 amounted to over 75.7bln EUR (42.2bln EUR in exports to Poland, 33.5bln EUR in imports from Poland), a near 8bln EUR difference from the Polish data, as the German methodology includes all the goods ordered by Poland via Germany. For many years now, the most important sector of trade exchange between the two countries has been machinery, which makes up between 20% – 25% of the turnover. The second place is taken by automotive sector and metallurgy. Paper, food, fuel, animal and textile products make up less than 5% of the trade value, German radio station Deutsche Welle reported in May. In Q1 2013, Poland has already exported to Germany ca. 9.12bln EUR worth of goods, which amounted to ca. 25.2% share in the overall export value. Germany remains the most important trade partner for Poland and is vital for its economy, as the value of exports to Germany makes up ca. 9% – 10% of Polish GDP. 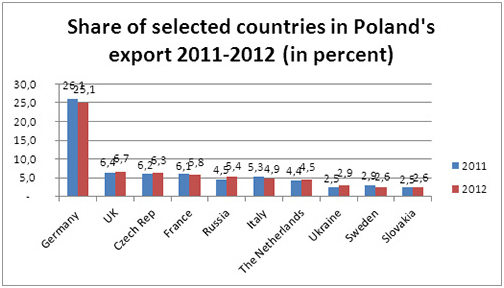 Yet for Germany, Poland continues to be the 10th contributor in exports and 11th in imports.